One of the most scoring as well as tricky part of Verbal Ability section is- Sentence Correction. What do you think can be the purpose of this topic? Well, it checks your grammar skills. In other words, you need to identify whether the sentence is grammatically correct or a part of it needs to be replaced. So, what do you need to know for that? A few fundamental rules of grammar and correct usage of words! In such questions, you may find a part of or the whole sentence in bold or underline and you are expected to find the correct phrase to replace it. Basically, you need to figure out the grammatical error in that particular part of a sentence. Most of the times, you will find that one of the options repeats the same phrase while the rest rewrite it in different ways. So, it’s for you to decide whether the given phrase is correct or not. We all have learned the basic grammar rules in our school days. 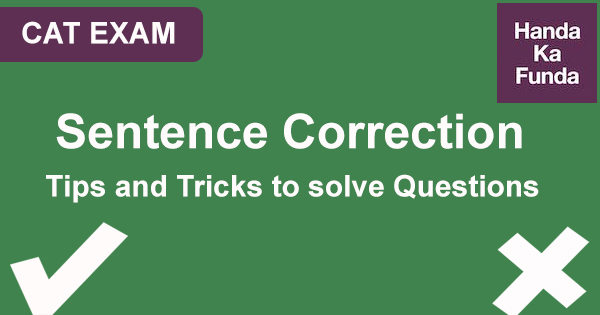 Now, let’s discuss some important rules and errors so as to tackle questions based on sentence correction. As the name says itself, the verb used in the sentence should be in accordance with the subject. Both should be either plural or singular at the same time. Let’s recall some of the essential rules of subject-verb agreement. In case of collective nouns (like police, army, herd, etc. ), the verb used is singular. Similarly, for subjects connected by ‘and’/‘or’, plural verbs are used. If the sentence begins with each/anyone/everyone, a singular verb is used. For the sentences that contain ‘either/or’ and ‘neither/nor’ pairs, the verb used will be singular if both the subjects are singular. In case one or both the subjects are plural, the plural verb is used. Similarly, in case of comparison, ‘I’ is used with the other subject. E.g. He is shorter than I am. Another important thing to identify here is the correct usage of pronouns as per the subject and object. In some cases, long sentences are given without the required verb. That calls for an answer option with the required missing verb. The correct way would be: Sitting in the garden, she was stung by a scorpion. In the above example, comparative degree is used. But in case of superlative degree, the person/thing compared is included in the rest of the class. E.g. John is the strongest of all men. Overall, you need to make sure that the different parts of speech (adjective, adverb, nouns, pronouns, conjunctions, interjections, verbs, etc.) are used appropriately and at the right place in the sentence. The very reason above-stated rules were discussed! Generally, in such questions, one or two rules are rules are used inappropriately. So, the first task is to identify the particular kind of error/s. Keep an eye on the time indicators (before, after, during, etc.). This can help you spot the verb tense errors easily. In some cases, the whole sentence needs to be rewritten. Once you have figured out the kind of error/s, try to make the correction without looking at the options. Sometimes, the given answer options are very close to each other and display very less difference. So, you need to extra careful in the examination of such choices. Read the full statement before selecting your answer. Also, if there are 2-3 similar answer options, that doesn’t mean one of them must be the right choice. The actual answer may be the completely dissimilar one. While going through the answer options, you may feel the initial particular option is correct and neglect the remaining. It is advised to go through all the options before deciding your answer choice. It is common to ignore the non-underlined part of sentence. But, this part may contain vital hints about the kind of error as well as the required answer. In case you are stuck with two options, choose the shorter one. Often the long sentences are added in the options to confuse the candidates. This also helps when you are unsure of the concept being tested. It is always wise to start examining the shorter options first, before moving on to the longer ones. Before you mark your selected answer, it is a good idea to read the sentence along with the answer option. Infact, it would be great if you read it a second time after the correct insertion. Also, sometimes, error is caused in an exceptional rule and not the usual standard rules. So, make sure the sentence makes sense. If it still seems too complex, listen to the sentence. In other words, say the sentence in your head and choose the option that sounds best to your ears. Multiple errors in a sentence and similar answer choices – complicate matters! Here, elimination strategy comes to your rescue. This technique proves effective in any kind of question. There would be some options that change the meaning of the sentence while some make it grammatically incorrect. In such cases, elimination technique will help you arrive at the right answer. Do not eliminate options with idioms or pronoun ambiguity in the first go. These pose problem only when the meaning of the sentence is altered. The options with ‘ing’ form is mostly incorrect and can be rejected outright. In some cases, the word pair (just as…so, not only..but also, etc.) is used incorrectly or half of it is missing. Finally, do not get stuck with a particular answer choice if it appears confusing to you. Go through the rest and eliminate the obvious ones first. So, now you are all set with the knowledge of important rules and strategy to handle sentence correction questions. The best way to remember the rules is to practice as much as you can. Mock tests and previous year papers will familiarise you with the kind of sentence correction questions that feature in CAT. Along with that, you need to have a good vocabulary base to understand the meaning of sentences given in such questions. Gaining expertise in this area can greatly enhance your score in CAT Verbal Ability section. Finally, try to solve these questions in a given time frame. Q2: A translator of literary works needs a secure hold upon the two languages involved, supported by a good measure of familiarity with the two cultures. Q3: For each of the past three years, temperatures have hit peaks not seen since the birth of meteorology, and probably not for more than 110,000 years. Q5: Both Socrates and Bacon were very good at asking useful questions. Q6: A fundamental property of language is that it is slippery and messy and more liquid than solid, a gelatinous mass that changes shape to fit. Q1: The process of handing down implies not a passive transfer, but some contestation in defining what exactly is to be handed down. Q3: The study suggests that the disease did not spread with such intensity, but that it may have driven human migrations across Europe and Asia. Q5: The implications of retelling of Indian stories, hence, takes on new meaning in a modern India. Q6: Before plants can take life from atmosphere, nitrogen must undergo transformations similar to ones that food undergoes in our digestive machinery. Q1: People who study children’s language spend a lot of time watching how babies react to the speech they hear around them. Q2: Neuroscientists have just begun studying exercise’s impact within brain cells — on the genes themselves. Q3: The water that made up ancient lakes and perhaps an ocean was lost. Q4Although we are born with the gift of language, research shows that we are surprisingly unskilled when it comes to communicating with others. Q5: Over the past fortnight, one of its finest champions managed to pull off a similar impression. Q6: Those geometric symbols and aerodynamic swooshes are more than just skin deep.